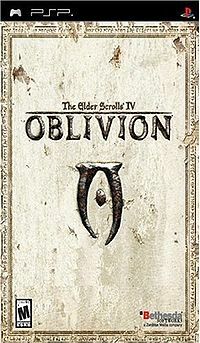 Oblivion (PSP) was a planned Elder Scrolls Travels game to be released around a year after TES IV: Oblivion. It would have been the fifth mobile game. It was planned to lack the free-roaming gameplay usually associated with the Elder Scrolls series. According to executive producer Todd Howard, the game would have featured ten large levels that look much like areas in the console versions, but more concentrated. Eighteen out of the twenty one skills from Oblivion were present. The controls were influenced by Metroid Prime. "The analog stick will allow you to move forward, backward, and turn sideways. Holding L will allow you to strafe, and holding R will let you look around the area from your character's perspective." The game was announced in the November 2006 edition of the Official PlayStation Magazine, which stated that, compared to the console versions, it was planned to be "a very different game with a different story line... it has the experience of the dungeon romp. It doesn't have wide-open, wander-the-landscape kind of stuff". The game was originally available for pre-order from several retailers, including GameStop, and was planned to be shipped in April of 2007. In November 2007 the deposits were returned to those who had pre-ordered, making it look like the game had been canceled. In January 2008, the game appeared on listings again, including Amazon. It was set for release on June 30, 2008. The price was listed at $39.99 on Amazon, with other stores selling it for $10 more. However, the game was never released. There has never been any official reason given for its cancellation or even official confirmation that it was canceled. Bethesda Softworks has declined to speak on the matter, and it is rumored that Climax Studios, the outsourced developers of the game, ran into difficulties. Esta página foi modificada pela última vez à(s) 20h48min de 25 de junho de 2015.